What makes a trout town? Does it hinge solely on an area’s proximity to coveted rivers, lakes, and streams? Or is it the confluence of top-notch anglers and a vibrant fishing culture? Personally, I tend to seek out the latter when searching for the next best destination for a multi-day fly fishing excursion. For me, true fly fishing culture requires more than a blue-ribbon stream on the edge of town. It needs fly shops and businesses on Main Street, wayward trout bums wandering the streets at questionable hours, and the obligatory craft brewery (or five). While the scene I’ve just described may sound like something out of a short story by John Gierach set somewhere in the Intermountain West, these places actually exist right here in our Blue Ridge backyard. Appalachia is teeming with world class trout fisheries and vibrant mountain communities whose economies are driven by fishing. They span the entire region, dotting the landscape like spots on a native brookie. They’re in places like Southwest Virginia, Western Pennsylvania, North Georgia and the mountains of Western North Carolina—the last of which could easily be called the epicenter of the East Coast fly fishing scene. Here are a few favorite Blue Ridge trout towns. With three in-town fly shops and more nearby honey holes than you can shake a four-piece 5 weight at, Sylva, North Carolina is a bonafide fly fishing paradise. It is the county seat of Jackson County, North Carolina, which boasts the famed Western North Carolina Fly Fishing Trail and an annual trout stocking rate somewhere in the neighborhood of 92,000. That’s roughly thirty five times more stocked trout every year than people living in the town of Sylva, so your chances of netting a fish are pretty good in Jackson County. When your day on the water is done, Sylva offers numerous restaurants and boasts one of Western North Carolina’s best craft breweries in Innovation Brewing. Fish here: Without a doubt, the most popular trout waters near Sylva flow through the Tuckasegee River—more commonly referred to by locals as the “The Tuck.” This wide flowing river, suitable for both wade fishing and float trips, rises in the Panthertown Valley before eventually finding its way into Lake Fontana. One of the most fishable, delayed harvest stretches of the Tuck lies between the Highway 107 bridge and Dillsboro park. Access to this amazing stretch of trout laden free stone can be gained via numerous pull offs and parking areas along North River Road. For more information about fly fishing near Sylva and in the Jackson County area, check out flyfishingtrail.com/fishing-spots. 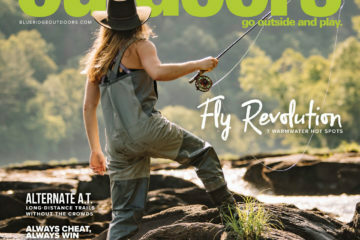 49 Pillar Dr. Cashiers, N.C.
Brevard, North Carolina is a heralded hot spot for all manner of outdoor adventure, but fly fishing is undoubtedly one of its biggest draws. One look at a map of Brevard and its immediate surroundings and it’s easy to see why. For starters, there’s the gin clear Davidson River, which flows past the entrance to Pisgah National Forest and parallels Highway 276 for several miles. This river was famously named one of America’s best 100 trout streams by Trout Unlimited, but it’s only the tip of the iceberg when it comes to fly fishing in Brevard and the surrounding terrain of Transylvania County. 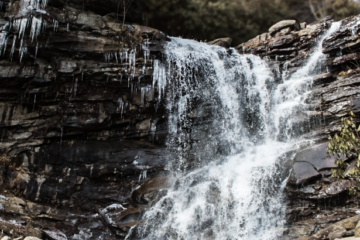 Dig a little deeper and you’ll find that such go-to trout waters as the East, North, and West Forks of the French Broad River along with Avery and Looking Glass Creeks are all within striking distance of this Blue Ridge mountain town. In addition to quick fishing access, Brevard beckons anglers with great local fly shops and guides such as Davidson River and Headwaters Outfitters, and it’s home to the Flymen Fishing Company, purveyor of high quality fly tying materials. On the libation front, Brevard is covering all its bases and then some with nationally renowned Oskar Blues Brewing and smaller local favorites like Brevard and Ecusta Brewing Companies. Fish here: Ditch the throngs of anglers often found along the banks of the more popular and notoriously tough-to-fish Davidson and head for the smaller but equally productive Avery Creek. This tributary of the Davidson serves as critical spawning habitat for both brown and rainbow trout and is open to fly fishing year round. From Highway 276, it’s accessible via Pisgah Stables Road and then on foot by way of the 2.3-mile Avery Creek Trail. When the Davidson is flowing high and muddy, this small trib is a proven go-to. 49 Pisgah Hwy #6 Pisgah Forest, N.C.
25 Parkway Rd. Rosman, N.C.
11 Mama’s Place Pisgah Forest, N.C. In all of my wanderings throughout Western North Carolina, I’ve yet to find a community that more genuinely deserves the moniker of “Trout Town” than Bryson City. Nestled in the North Carolina portion of the Great Smoky Mountains not far from the cold, trout-rearing waters of Fontana Lake, Bryson City sits perched on the edge of the aforementioned Tuckasegee River. 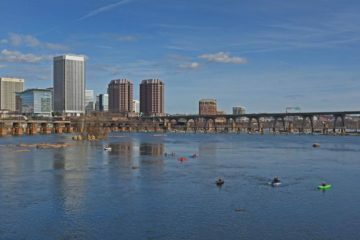 Anglers looking for delayed harvest fishing on the Tuck don’t even have to leave the downtown area, but venturing beyond the city limits is well worth the effort. Other nearby options include the Nantahala River, the Little Tennessee, and the Oconaluftee, not to mention the miles of blue lines hiding in more remote sections of nearby Great Smoky Mountains National Park. Once you decide that it’s time to hang up the waders and hit the town, head for the Nantahala Brewing Company. This downtown Bryson City staple has been putting out stellar craft concoctions since 2009. They’re known throughout the region for such flagship staples as the Noonday IPA, the Dirty Girl Blonde, and the App Trail Extra Pale Ale, and they recently opened a brew pub just a few blocks down from the original tap room on Depot Street. 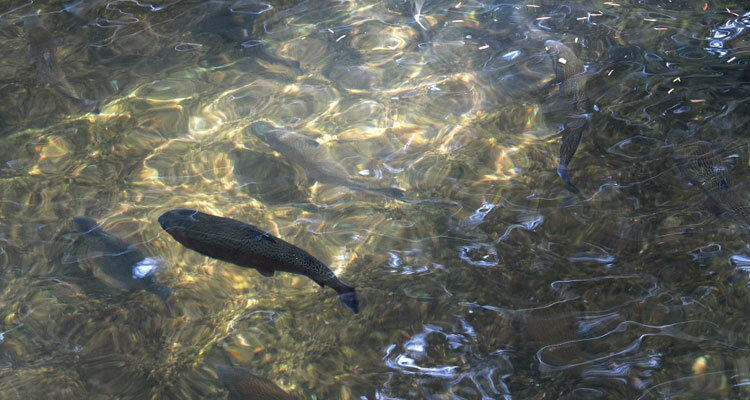 Fish here: For wild trout, leave the comforts of town and head for Great Smoky Mountains National Park. Deep, Hazel, and Eagle Creeks are all great backcountry honey holes, but they only scratch the surface of what this park can offer intrepid anglers who are willing to venture off the beaten path. 3 Depot St. Bryson City, N.C.
14157 W Hwy 19 Bryson City, N.C. The North Georgia mountains have long served as a respite for nerve-shaken and overcivilzed urbanites from nearby Atlanta and other population centers throughout the Southeast. 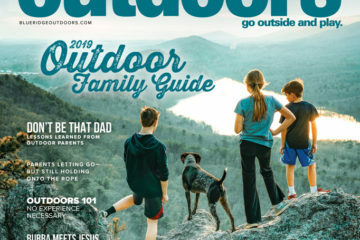 While the entire northern region of Georgia is a fly fishing destination in its own right, the tiny town of Blue Ridge, located in Fannin County, is its undisputed trout capital. One stroll along this tiny mountain town’s Main Street and you’ll encounter two high end fly shops, a fishing inspired inn, and the workshop of world-renowned bamboo rod maker Bill Oyster. Beyond fly fishing-related businesses, downtown Blue Ridge boasts a small, locally-owned outdoor shop called Blue Ridge Mountain Outfitter and three craft breweries, Fannin Brewing Co., Grumpy Old Men Brewing, and Blue Ridge Brewery. 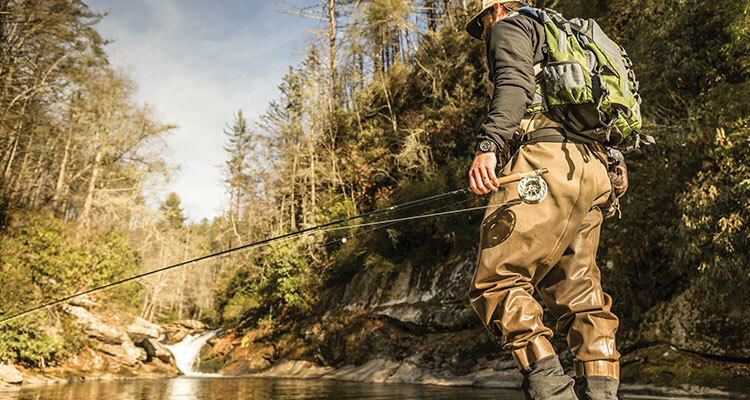 Fish here: The Toccoa River is home to some of Fannin County’s biggest trout, and it’s widely known for offering some of the Peach State’s best fly fishing opportunities. You can access the upstream section via the U.S. Forest Service’s Deep Hole Recreation Area or hop on the downstream portion from Blue Ridge Dam to where the lower Toccoa crosses into Tennessee. When it comes to the outdoors, Abingdon, Virginia may be best known as the home of the popular Virginia Creeper Trail, which runs through the heart of town and continues on to nearby Damascus, or for its proximity to Grayson Highlands State Park, Mount Rogers National Recreation Area and the Appalachian Trail. But in recent years this tiny trail town has been flying under the radar as the hub of Southwest Virginia’s robust fly fishing scene. One look at a map of nearby rivers and it’s easy to see why. Closest to town is Whitetop Laurel Creek. This trout-laden freestone, which parallels both the Virginia Creeper and the Appalachian Trail for long stretches, is widely regarded as one of Virginia’s best trout fisheries because it’s known to harbor 20-inch brown trout and a thriving population of wild rainbows. Beyond Whitetop you’ll find such fisheries as the South Fork Holston River, Big Wilson Creek in the Mount Rogers Recreation Area, and the New River of nearby Grayson County. Fish here: Whitetop Laurel Creek is up there with some of the best wild trout rivers in the entire Southeast. For anglers, the place to begin on Whitetop is the 6 miles of stream that flows below Konnarock, Virginia, beginning at Creek Junction, near the confluence of Whitetop and Green Cove Creek. This marks the beginning of a 6-mile artificial only stretch where all trout smaller than 12 inches must be released. This stretch can be accessed by way of Creek Junction Road, about 25 miles southeast of Abingdon. Those in the know say that prime time on Whitetop is during the spring months when feeding trout will rise for just about any kind of dry fly you can throw at them. 16501 Jeb Stuart Hwy. 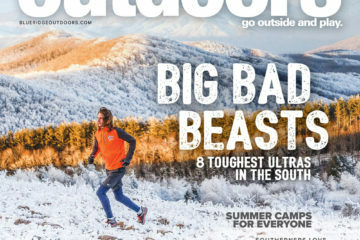 Abingdon, VA.
Boone, North Carolina is a bonafide adventure hub, boasting some of the best mountain biking, hiking and rock climbing you’ll find anywhere east of the Rockies, and the High Country surrounding Boone is veined with some of Western North Carolina’s most productive trout waters. In terms of tailwaters, the Boone area offers both the Watauga and the South Holston Rivers. Anglers looking for smaller creeks and streams should consider Beech Creek, Boone’s Fork Creek, Laurel Creek, Dutch Creek, and the Middle Fork of the New River, just to name a few. Don’t despair when your day on the trout waters of the Western North Carolina High Country is done because non-fishing related fun abounds in Boone. I’d suggest starting your tour of Boone’s food and drink scene with a visit to Appalachian Mountain Brewing whose Long Leaf IPA is one of the best in the business. 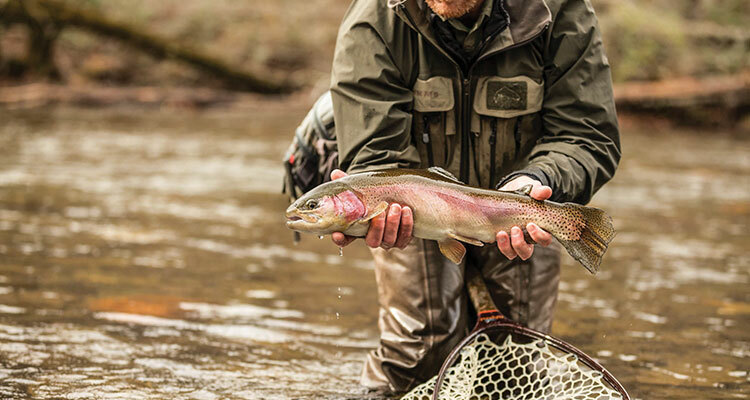 Fish here: The width of the Watauga River and the openness of its banks as it flows through Valle Crucis separate this river from its Southern Appalachian counterparts. More reminiscent of the type of rivers found out west than those typically located in the Blue Ridge Mountains, the conditions found on this stretch of water are a welcome respite for the rhododendron-weary fly fishers. In Valle Crucis you’ll find ample public fishing access leading to rainbows, browns and the occasional brookie. From October 1 to June 5, this portion of the Watauga becomes a designated Delayed Harvest stream, which means all netted trout must be released to fight another day. 2575 NC-105 Suite 60 Boone, N.C.
Harrisonburg, Virginia is a town of just over 50,000 nestled in the heart of the Shenandoah Valley between the George Washington and Jefferson National Forest and Shenandoah National Park. 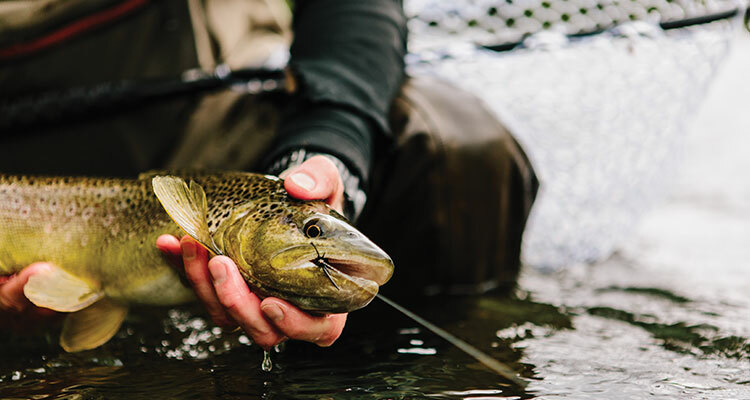 It’s location alone makes it a desirable destination for anglers from all over the East Coast, and the recent relocation of venerable guiding service and outfitter Mossy Creek Outfitters has infused this bike-crazy town with a healthy dose of fly fishing culture. When the fishing is done, head over to Pale Fire Brewing or Brothers Craft Brewing for some of the Shenandoah Valley’s best hand-crafted beer. Fish here: First opened to the public in 1978, Mossy Creek, the namesake stream of Mossy Creek Outfitters, is one of Virginia’s best spring creeks. This limestone creek carves a path through a picturesque pastoral setting and harbors undulating masses of aquatic vegetation, swift runs, and steep drop-offs. It is a challenging waterway that some anglers dedicate a lifetime to, but those who crack the code are often rewarded with 25-inch brown trout hook-ups. 480 E Market St. Harrisonburg, VA. Situated in the heart of the Greenbrier Valley near the banks of the Greenbrier River, Lewisburg, West Virginia is a great place to start when seeking out Mountain State trout. The valley where this trout town lies offers easy access to long stretches of the Greenbrier and Meadow Rivers along with their cool-water, trout friendly tributaries. One such tributary is Anthony Creek, located just north of town in the Monongahela National Forest. Here you’ll find clear water featuring long runs and deep holes that harbor healthy populations of brown, brook, and rainbow trout thanks to steady stocking schedules. Reasons to visit Lewisburg don’t begin and end with fly fishing. This town is offering up options for foodies, outdoors enthusiasts, and shoppers alike. For a taste of the Mountain State’s brewing scene, head to Greenbrier Valley Brewing Company. If you’re looking for a place to stay, consider pitching a tent at the Greenbrier Valley Campground just 15 minutes from downtown Lewisburg. Fish here: A stocked stream known for its large brown trout, the gravel-bottomed and spring-fed Second Creek is designated by the state for fly fishing only. To access this stream, head to the tiny town of Ronceverte, just ten minutes from downtown Lewisburg, and head south on State Road 219 to County Road 65. Continue on until you reach County Road 62 and hang a right. This will eventually lead you to the low-water bridge and the beginning of the special regulations area of Second Creek. 829 Washington West Lewisburg, W.Va.